I have always admired the portraits of local personalities upon the walls of The Golden Heart in Commercial St but I never knew who took these elegant pictures, so I was delighted when Ricardo Cinalli introduced me to the photographer Lucinda Douglas-Menzies in his studio in Puma Court this week. Lucinda first came to live in Spitalfields in the late nineteen eighties when she met her future husband Anthony de Jasay. They brought up their two children here in his old house in Elder St and now live in a flat above the Spitalfields Market. She has enjoyed a distinguished photographic career with more than seventy works in the National Portrait Gallery collection and recently completed a series of thirty-eight portraits of eminent astronomers which were exhibited at the National Portrait Gallery and around the country in 2009. Next day, Lucinda kindly invited me round to her modest studio on the first floor of the Heba building in Brick Lane, where she explained that it was Sandra Esqulant who first offered her an exhibition at The Golden Heart. Having accepted Sandra’s offer, once Lucinda considered the scale of the rooms and the social nature of the space, it became apparent that a collection of portraits would be ideal. So, with Sandra’s advice, Lucinda began approaching local people, some were her neighbours and friends, others were patrons of The Golden Heart that Sandra knew – and quickly the project acquired a life of its own. Taking these lively portraits and displaying them in this celebrated meeting place proved such a popular success in 2002 that another exhibition followed in 2004, and the pictures of Sandra’s closest friends still hang in pride of place upon the bar wall today. It is my pleasure to publish these lucid images from Lucinda Douglas-Menzies’ Spitalfields Portraits. Although you may recognise some of Lucinda’s subjects, in compiling this new selection, we have deliberately picked others that we wish to introduce to you. 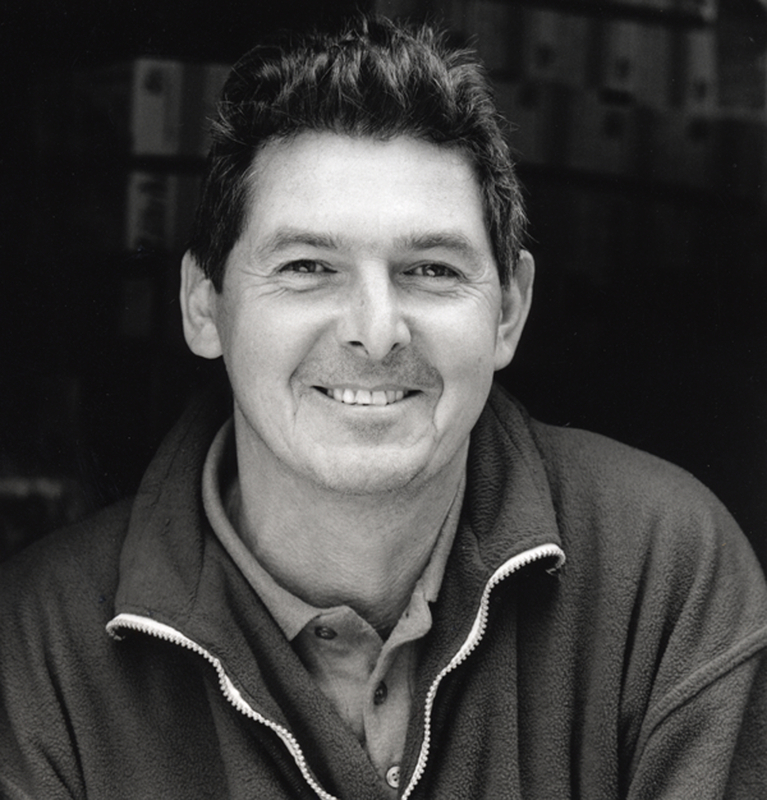 At the top is Eric Reynolds, founding director of Urban Space Management who is fondly remembered – amongst his other regeneration schemes – for his revitalisation of the Spitalfields Market in the early nineties. When he showed Lucinda around the Bishopsgate Goods Yard, he hoped he might be able to bring life back to the vast abandoned brick arches there, but he went on to develop a centre for arts and creative activity at Trinity Buoy Wharf instead. Lucinda remembers Eric arrived for the session on his motorbike, wearing the full-length raincoat you see in the picture, and she photographed him in 2004 standing on the former railway bridge over Brick Lane. “I got to know Gary Wilson from buying fruit at his stall outside Whitechapel Station,” explained Lucinda, remembering this vibrant personality who suffered a heart attack and died while still young, photographed here in the midst of life, standing at the rear of his van. 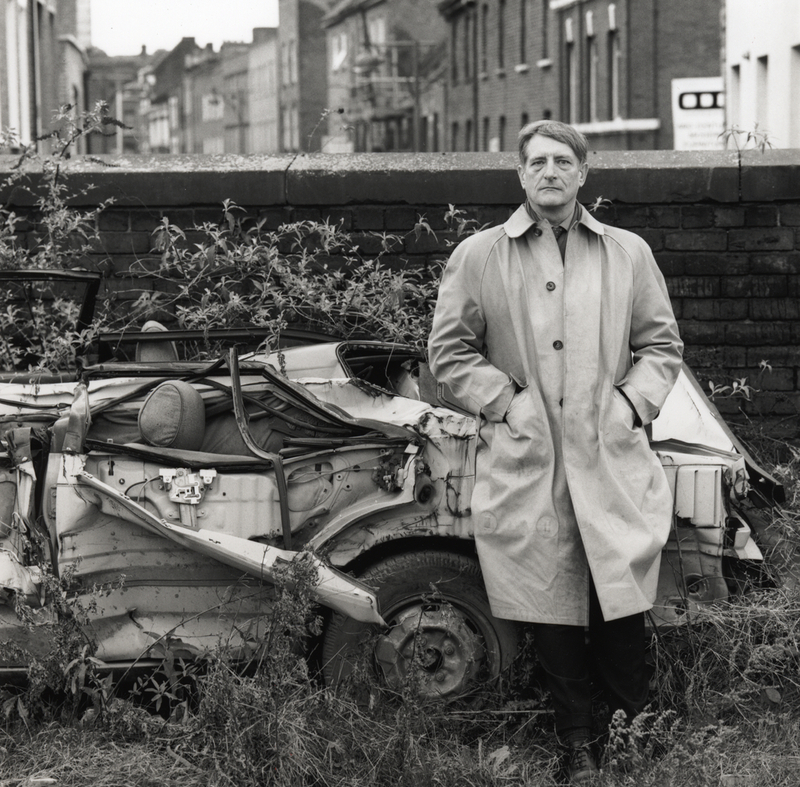 “He was really nice guy who worked on equal terms alongside the Bengali traders – he cut through all the barriers.” recalled Lucinda affectionately, “Many of my subjects came to the East End but he was born and bred here – as local as anyone could be.” His unexpected death endows this portrait of 2004 with a haunting poignancy today. 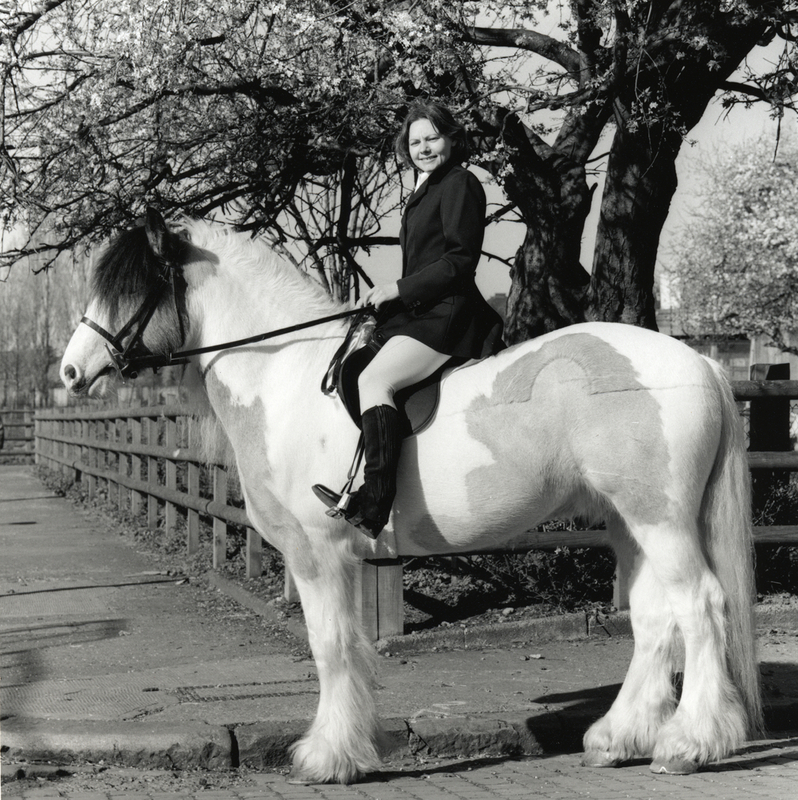 Michelle Norgan pictured in 2002 astride Chester her Cob, outside the Spitalfields City Farm that she helped run for many years. The perfection of this bucolic image with its immaculately groomed horse and correctly turned out rider, standing under the may trees in blossom, exists in strange contrast to the urban images that define this collection of pictures, yet the farm is an integral part of the identity of Spitalfields. Michelle gamely dressed up for this picture in a formal outfit, entirely unlike her usual work clothes, to create this exuberantly absurd tableau. 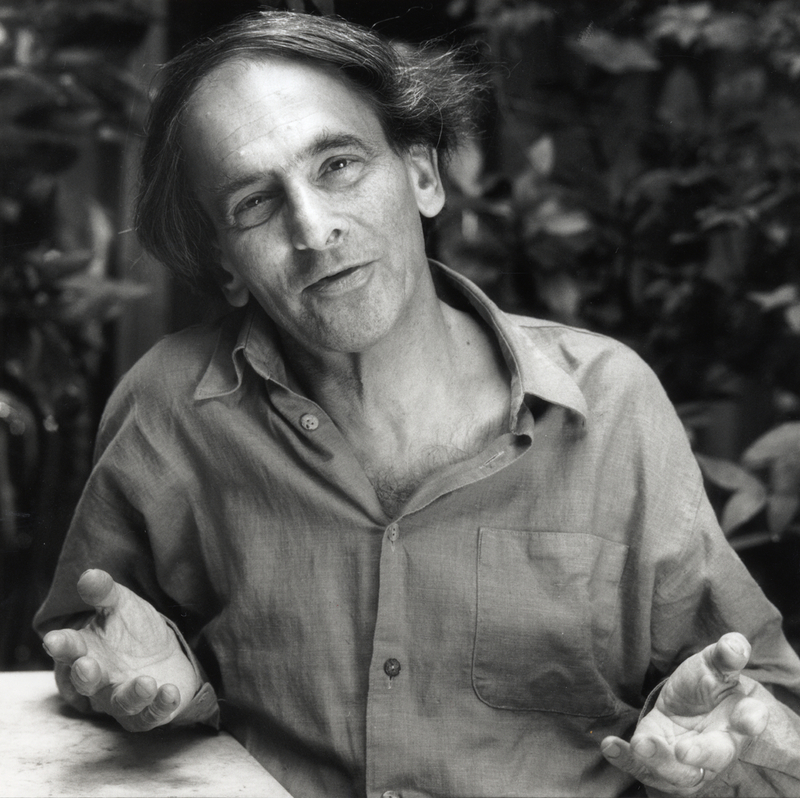 Raphael Samuel was Lucinda’s neighbour and became a friend, a circumstance which afforded the opportunity for this luminous intimate portrait taken three years before his death in 1996. Pre-eminent historian of the East End and author of “Theatres of Memory”, Raphael Samuel, with his wife Alison Light, was one of the very first to move to Elder St in appreciation of the architecture in the days when the street was derelict. The East London History Centre at the Bishopsgate Institute where his papers are preserved is today named the Raphael Samuel Centre in his memory. 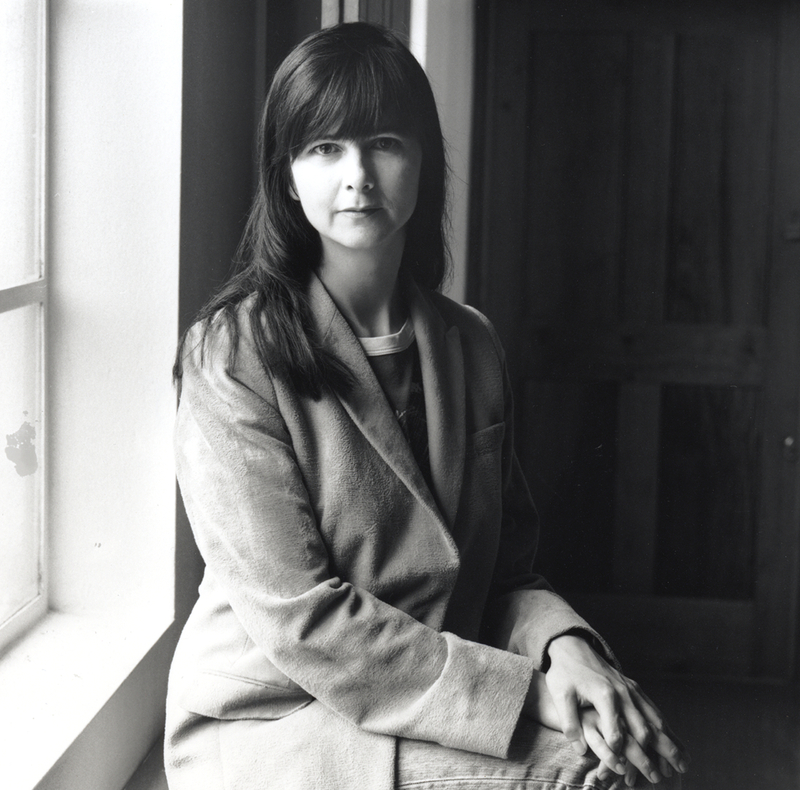 This portrait of artist and Spitalfields resident Gillian Wearing was taken at a sitting with her partner Michael Landy. The portrait of Landy is in the National Portrait Gallery and their joint portrait can be seen at The Golden Heart, yet this picture has not been published before. I wanted to include it here because it is one of my favourite of Lucinda Douglas-Menzies’ photographs, a quiet masterpiece of classical portraiture in which the simplicity of composition and poise of the sitter serve both to disarm and captivate the viewer. 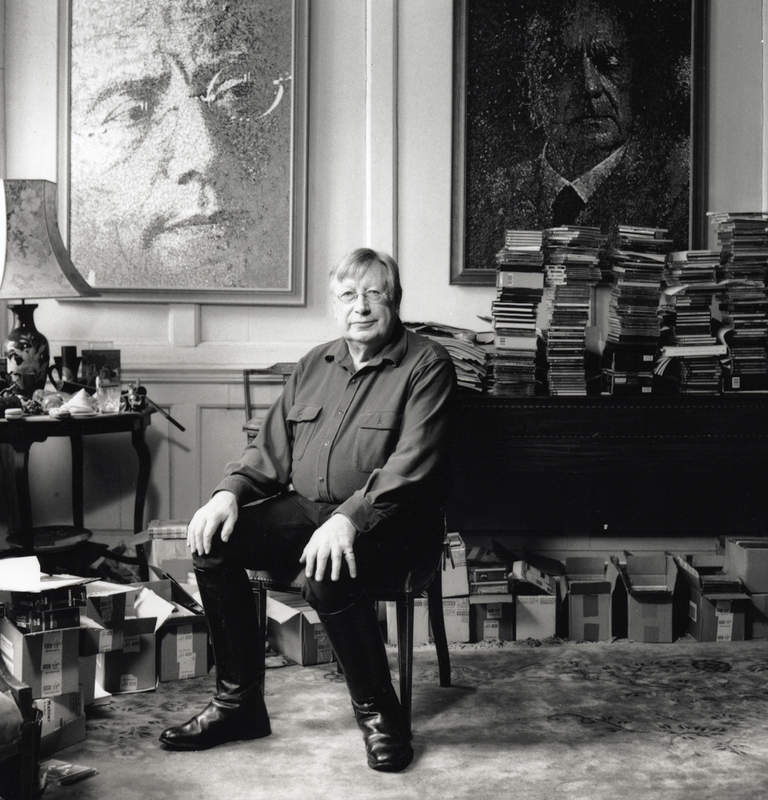 Critic Edward Greenfield, pictured here in in 2004 in the living room of his house in Folgate St, looks very fine in his beautifully polished riding boots, surrounded by the tottering piles of CDs that have overtaken his dwelling, and which, in their overwhelming profusion, manifest the concrete evidence of his encyclopaedic knowledge of music. On the staff of the Guardian for over forty years, among his many accomplishments, Edward Greenfield is a popular broadcaster, a regular contributor to Gramophone magazine since 1960 and co-author of the Penguin Guide to CDs. 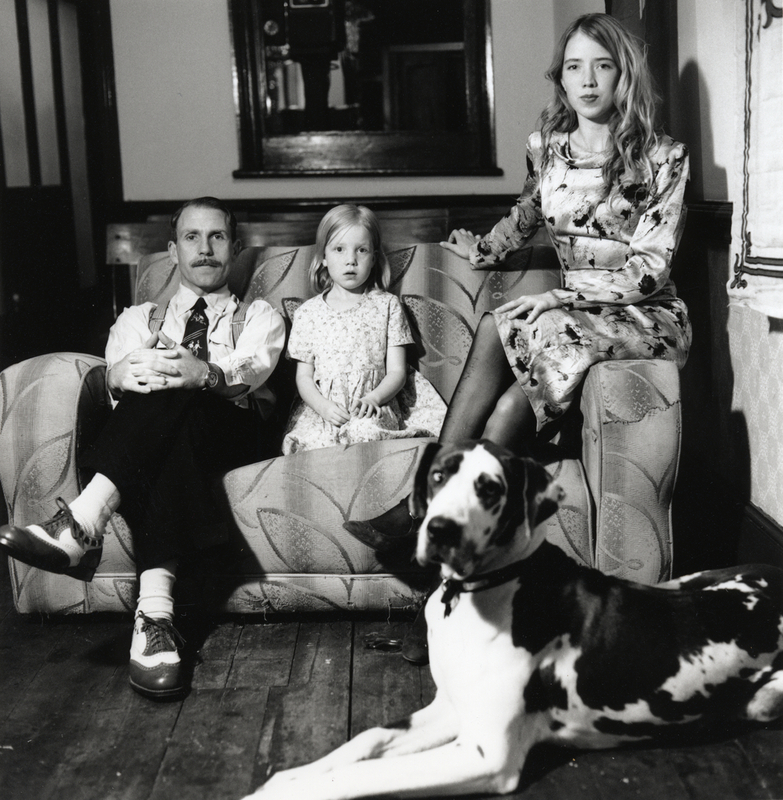 Johnny Vercoutre, Tilly Vercoutre, Suzette Field and Glory photographed in 2004 at their home in Shoreditch High St, furnished throughout in a rigorously authentic early twentieth century style, and including a private cinema. On the ground floor, Johnny runs “Time for Tea”, and in the surrounding streets you will commonly see examples of his collection of vintage trucks and vans that he hires out for films. 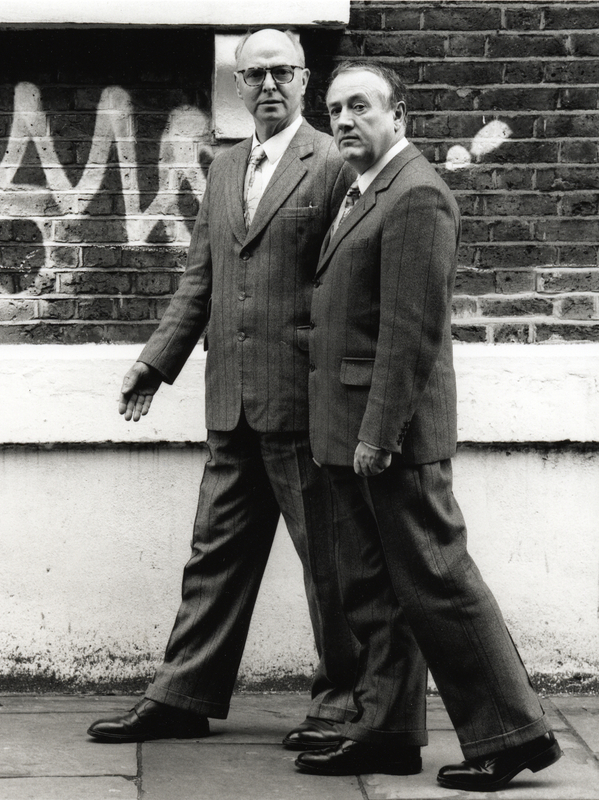 In 2009, Suzette Field opened the singular “Shop of Horrors” with Viktor Wynd on Mare St.
As everyone who lives in Spitalfields knows, Gilbert & George walk everywhere, and Lucinda wanted to capture this perambulatory quality in her portrait, so she asked them to walk down Fournier St and freeze in the moment of walking. It was an inspired gesture on her part which imbues the illustrious duo with the surreal quality of mechanical figures, permitting them scope to perform upon the stage of the urban theatre that is their imaginative universe. I found this article so interesting – as with every one of all the others written by the Gentle Author. The Responses section is also well worth reading as the memories of readers are so interesting.